Go to original pattern for design DROPS 73-22. DROPS Striped Pullover in Paris. 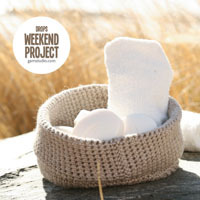 You can get the yarn to make this pattern from	23.40$. Read more. 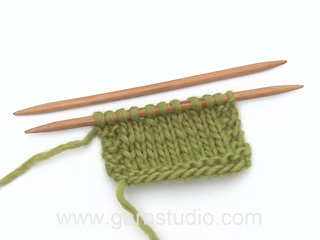 Gauge: 10 sts x 12 rows in stockinette st with 2 strands Paris on larger needles = 10 x 10 cm. Stripe pattern: See chart. The entire pattern is knit in stockinette st.
Back: Cast on 40-44-48-52-56 sts on smaller needles with 1 strand dark violet + 1 strand denim blue. 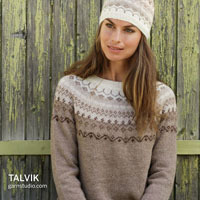 Follow stripe pattern – the first 4 cm are knit in rib, then change to larger needles and stockinette st. When the piece measures 9-9-10-10-10 cm inc 1 st at each side and when the piece measures 18-18-20-20-20 cm inc 1 st at each side = 44-48-52-56-60 sts. When the piece measures 30-32-33-34-36 cm bind off 4 sts at each side for armhole. Then shape raglan - see knitting tips: dec 1 st every 4 rows: 2-2-1-1-1 times, then dec 1 st every other row: 7-5-7-6-4 times and then every row: 0-4-5-8-12 times. Bind off the remaining 18 sts, the piece measures approx. 48-50-52-54-56 cm. Front: Cast on and knit the same as the back. Shape raglan as on back. At the same time when the piece measures 42-44-46-48-50 cm put the center 8 sts on a st holder for the neck, then dec 1 st at each neck edge every other row 4 times. 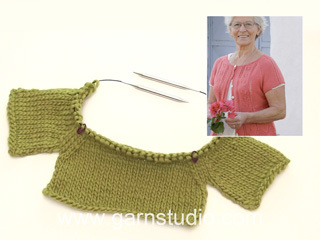 After all raglan and neck shaping is complete 2 sts remain on each shoulder, bind off. The piece measures approx. 48-50-52-54-56 cm to shoulder. Sleeve: Cast on 24-24-28-28-28 sts on smaller needles with 1 strand dark violet and 1 strand denim blue. 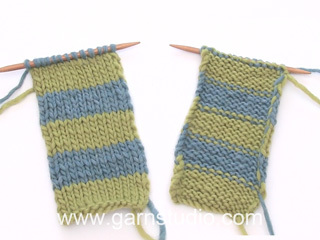 Follow Stripe Pattern – the first 7 cm are knit in rib, then change to larger needles and stockinette st. At the same time, after the rib inc 1 st at each side every 5.5-5.5-6-5.5-5.5 cm a total of 8-8-7-8-8 times = 40-40-42-44-44 sts. When sleeve measures 50-51-51-51-51 cm bind off 4 sts at each side. Then shape raglan inside of 1 edge st - see knitting tips: dec 1 st every 4 rows: 2-2-1-1-1 times, then every other row: 5-5-8-8-8 times, then every row: 4-4-3-4-4 times = 10 sts remain on needles. Bind off, sleeve measures approx. 68-69-70-71-71 cm. Assembly: Sew all raglan seams using 1 edge st as seam allowance, leaving one seam unsewn between sleeve and back. Pick up approx. 46-52 sts around the neck on smaller needles with 1 strand lilac + 1 strand denim blue. 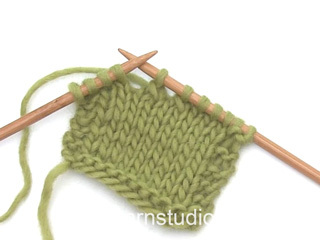 Knit 4 rows stockinette st back and forth on needles, bind off - the neckband will roll. Sew remaining seam and up along neckband. Sew sleeve and side seams. Bonjour Agnès, vous rabattez 8 m pour les emmanchures = restent 52 m puis vous diminuez pour le raglan de chaque côté: 1 x 1 m, 4 x 1 m et 12 x 1 m soit 1 + 4 + 12 m x 2 côtés = vous diminuez 34 m au total, il reste: 52-34=18 m. Bon tricot! Kan man strikke blusen rundt på rundpind? Hej Marianne, du er velkommen til at strikke blusen rundt på rundpind, vi har dog ikke mulighed for at ändre i opskriften. God fornöjelse ! Hur mycket garn går åt till denna tröjan man vill göra den enfärgad eller i bara 2 färger eller om jag vill använda Big merino istället ? Die Anleitung wurde gerade komplett überarbeitet, ich hoffe, dass nun klar ist, wie die Raglanabnahmen gemeint sind. Wenn noch Fragen geblieben sind, melden Sie sich gerne wieder. Bonjour Flo, pour réaliser ce modèle d'une seule couleur, additionnez les quantités de chaque couleur, il vous en faudra probablement un peu moins. Bon tricot!